A few months back, (Jan 20, 2016), The Astrophysical Journal had a paper by two researchers (K. Bayugin and M. Brown) announcing the possible discovery of another planet in the solar system. The planet’s existence has been inferred from anomalies in the orbits of several dwarf planets beyond Pluto (Kuiper Belt objects). A large Neptune sized planet is hypothesized, to account for these orbital perturbations. I have called this planet X9 in a previous blog, as a bit of an astrophysics/science fiction gag on my part. The X can stand for “unknown”. But it can also stand for 10, as in Roman numerals, since it would be the 10th planet under the old system, which had Pluto as the 9th. But, since Pluto has been demoted to “dwarf planet”, the new planet is really number 9. Thus, via a sort of planet naming mash-up, I will call it Planet X9. Plus it reminds one of “Plan 9 from Outer Space”, one of the all-time best good-bad science fiction movies. I note in the paper referenced below, the planet is referred to as “candidate Planet Nine”. That sounds less Sci-Fi, and more Poli-Sci, but whatever. A recent paper by E. Linder and C. Mordansini (to be published in Astronomy and Astrophysics, I read a pre-print on arXiv:1602.07465v2) took the hypothesized location and size of the unseen planet, and used some simulation software to infer other properties of the planet, based on principles of planet formation and evolution. Here’s what I took away from reading their paper. 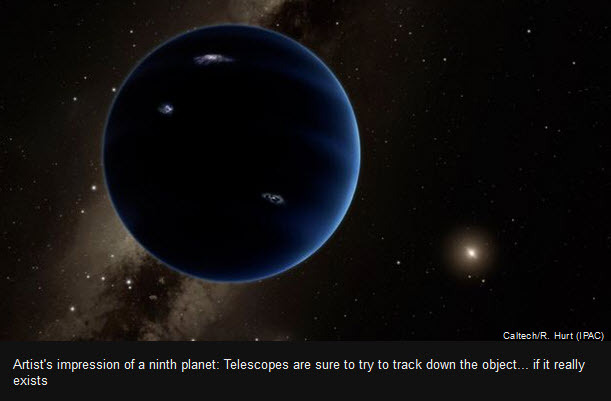 Basically, they assumed that Planet 9 would have started off with a similar structure to Uranus and Neptune, after the initial formation of the solar system, from the pre-solar system gas cloud that is assumed to have formed the system. 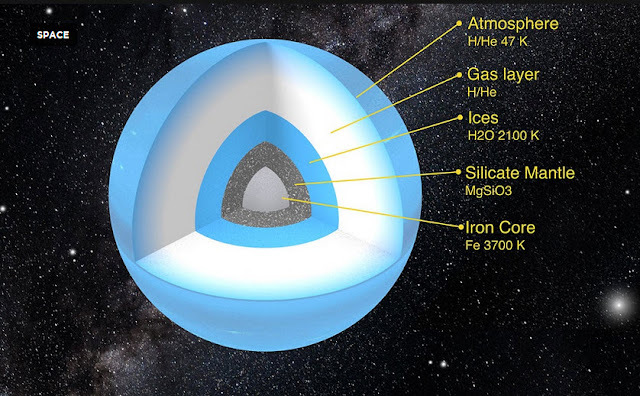 Their planet evolution model assumed that there was a central iron core, surrounded by silicate mantle, then water ice, then finally a hydrogen/helium envelope. The eventual size and luminosity of the planet are derived by modelling the evolution of such a planet, via contraction and cooling of the gaseous envelope, as well as possible radiogenic heating (radioactive elements in the core). Their initial model was based on a 10 earth-mass planet located at 700 astronomical units (earth-sun distances). The core was assumed to have 8.6 earth masses and the envelopes to have 1.4 earth masses. These are similar proportions to Uranus and Neptune. The initial luminosity was set to about 1.4 times Jupiter’s. This is referred to as the “nominal case”. The parameters were then adjusted for further simulations. The modelled planet was then allowed to evolve for about 4.5 billion years, to predict what it might look like now. The nominal case gave a planet of about 3.7 Earth radii by now (23,300 km). The intrinsic luminosity is predicted to be about .006 that of Jupiter (less than 1%, Neptune is about .01 or 1% of Jupiter). The current temperature is expected to be about 47 degrees Kelvin, and emitted radiation would peak at about 620 nanometers, in the far infrared. That temperature is much higher than the equilibrium temperature of a cold body at that distance from the sun, which is about 10K at 700 AU. So, basically, the planet should “shine” rather brightly in this wavelength. This assumes that heat from the interior is able to be conducted to the exterior fairly readily. As you can see, the planet would be most visible in the Q-band, which is far infrared, rather than the others, which are visible to near infrared. Note also that that the band naming conventions can be a bit confusing, depending on the type of astronomy under consideration. Magnitudes are an inverse scale, so lower numbers means it is easier to detect. Brightness, of course, will vary with distance, over the orbit and that will depend on the orbit’s eccentricity and inclination. Many of their other models show broadly similar characteristics for the planet, by this time in the age of the solar system. Some models started the planet off much closer to the sun, before becoming ejected to the outer fringes of the solar system. In others, the initial luminosity was changed. In neither case was the luminosity of the planet at present much changed. The initial composition of the planet was also varied (ratio of core to envelope). That tended to effect the current day luminosity, as it affects how efficiently heat is transported from the interior. In general, the efficiency of heat transport could have the most significant impact – if the planet had similar properties in that regard as Uranus seems to, it would be much cooler (about 27 degrees Kelvin), and thus radiate less strongly in the far infrared. When we finally do see it (if we do), such matters could give us some idea of what it is actually made up of (will constrain theoretical models). Varying the orbital parameters (aphelion, perihelion) and thus the distance had an effect, mostly due to simple drop-off of brightness with distance. 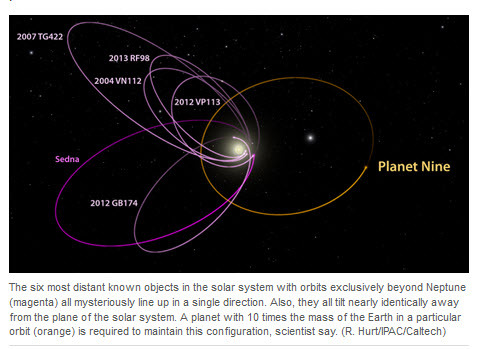 So, these findings could help in the search for the new planet. They show that the far infrared should be the band in which the planet would be most visible, so instruments that specialize in those frequencies would be good candidates to use in a search. The paper reviewed some of the surveys that have been done in those wave bands, in the general area in which the planet is supposed to exist. Most of those surveys would have had a low probability of spotting the planet, as its inclination to the ecliptic is thought to be quite high, at about 30 degrees, and the surveys tended not to go that high above the ecliptic (generally no more than 10 degrees). Those that did search higher up, happened to use instruments that observed in wave bands where the planet does not shine brightly, so the instrument was not capable of detecting an object as dim a the supposed planet. At least one survey probably constrains the size of the planet, though, to be less than 50 Earth masses. Future telescopes with greater sensitivities will be needed for the search, depending on which band is used by the instrument. It seems reasonable that a dedicated survey will eventually be launched, to find, or rule out, this assumed new planet, probably within the next half decade or so. P.S. : Many thanks to Scott Olausen PhD Astrophysics, McGill University, for a quick proofread of this little blog. 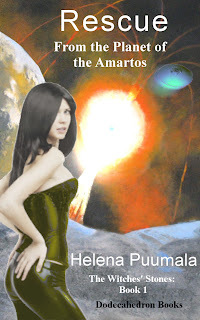 And here’s a science fiction novel which includes plenty of action on an unexplored planet. It’s good to occasionally take a break from real science, and read some science fiction :).